In recent years, pedestrian and bicyclist fatalities have accounted for roughly 16 percent of all traffic fatalities, according to the Fatality Analysis Reporting System. Approximately 25 percent of nationwide pedestrian and bicycle fatal and injury crashes occur on rural roadways. In contrast to urban roadways, rural roads have certain characteristics that can increase the severity of crashes for pedestrians and bicyclists, such as higher average vehicle speeds and uncontrolled pedestrian and bicycle crossings. Pedestrians and bicyclists use local and rural roads for commuting, recreation, and necessity. Bicyclists in local and rural areas may vary in their levels of ability and expertise in riding with motor vehicle traffic; for example, more experienced or competitive bicyclists tend to prefer using the roadway rather than separate facilities, while inexperienced bicyclists may lack the confidence, and perhaps the skills necessary, and are sometimes hesitant to use the roadway. Pedestrian facilities vary in local and rural areas and needs vary by age and ability. This is especially true in areas where young children or an aging population use the pedestrian facilities, such as areas near schools or elderly care facilities. There are several enhancements that can be introduced to improve safety for pedestrians and bicyclists. The safety treatments shown in the table below can be employed to improve pedestrian and bicycle safety at intersections in particular. The table also shows the associated crash modification factor (CMF)1 or crash reduction, the safety issue addressed, and the typical cost of implementation. The following list of roadway elements and associated safety enhancements can be used by local and tribal transportation agencies, town councils and commissions, and developers to design or approve road projects. These enhancements can improve safety for drivers, too. Intersection offsets – Offset intersections may discourage pedestrians from crossing at a marked intersection crosswalk and "encourage" pedestrians to cross at midblock locations that are not marked. By aligning intersections and driveways to tie at a single location, pedestrian safety enhancements at that location can be more impactful. 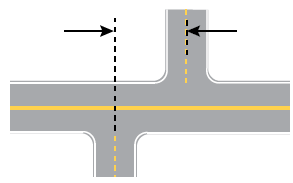 Approach angles – Providing intersection approaches with little to no skew offers motorists more sight distance to detect approaching motorists, pedestrians, and bicycles without the need to turn their entire body. Having little to no skew is especially important to older drivers, who may have a limited range of motion to scan approaching traffic in several directions. Presence or width of shoulders – At locations where shoulders are not present or are narrow, the addition of shoulders or extra shoulder width may allow pedestrians and bicyclists to travel with a buffer from moving traffic without impeding vehicular flow. Driveway locations – Prohibiting driveways within an intersection's functional area helps to focus the driver's attention on the intersection, including the presence of pedestrians and bicycles, instead of being distracted by other surrounding activities. Number of driveways – Consolidating several driveways into a single entrance can improve pedestrian, bicycle, and motorist safety by limiting the number of conflict points. It is also important to locate this single entrance an ample distance away from the intersection to minimize conflicts. Curve/curb radii – A large curb radius essentially widens the intersection, making pedestrian crossing times longer and increasing exposure. It is important to balance the curb radius design between the needs of pedestrians and large commercial vehicles. Sight distance – Unrestricted sight distance at intersections and locations where pedestrians and bicycles are known to travel helps motorists perceive and react to their presence. Signs – Roadside signs should be mounted at an appropriate height such they do not interfere with pedestrian and bicycle movements, nor should the signs obstruct travelers' ability to see oncoming traffic. Roadside obstacles, including utility poles and mail boxes – Roadside obstacles can prevent motorists from recognizing approaching pedestrians and bicyclists and vice versa. The needs of pedestrians, bicyclists, and motorists should be considered during design and placement of such objects. Shoulder or edge line rumble strips – Be aware of frequently traveled bicycle routes when determining whether to place shoulder or edge line rumble strips. Where bicycles are present, include gaps in shoulder or edge line rumble strips. Educate pedestrians to walk against, not with, the flow of traffic and to stay off the travel lane. Encourage pedestrians and bicyclists to wear reflective or brightly colored clothing to improve their conspicuity. Involve the community in improving pedestrian and bicycle safety by establishing advocacy or advisory groups, including those focused on children, older adults, and individuals with disabilities. Provide enforcement to target speeding and aggressive driving maneuvers in strategic locations with a high concentration of pedestrians and bicyclists, such as school zones. American Association of State Highway and Transportation Officials (AASHTO), Guide for the Planning, Design, and Operation of Pedestrian Facilities, July 2004. American Association of State Highway and Transportation Officials (AASHTO), Guide for the Development of Bicycle Facilities 2012, Fourth Edition.